Chow Down Seattle: FOOD EVENT: Take a Bite out of Seattle! FOOD EVENT: Take a Bite out of Seattle! This year marks the 28th year of Bite of Seattle. 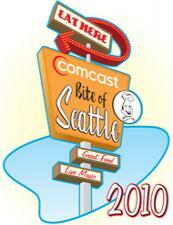 The popular Seattle food festival hosts over 50 Seattle area restaurants and more than 30 food product companies. The Bite has five outdoor beer gardens and Wine & Jazz, a wine-tasting exhibit promoting nine West Coast wineries. The weather is supposed to be great, so grab your appetite and head on down to Seattle Center!